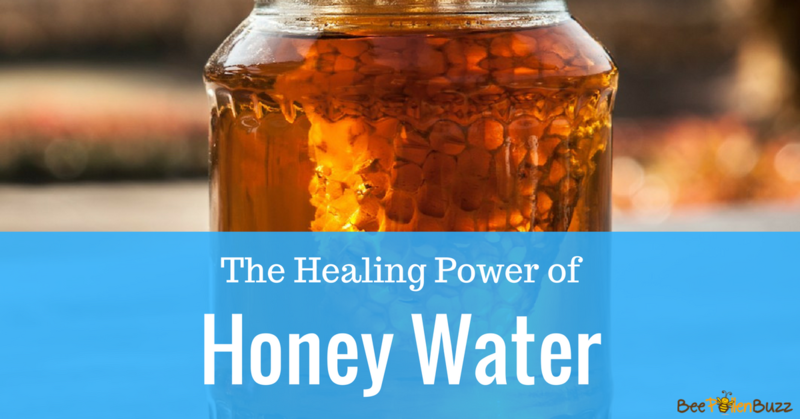 Drink Honey Water daily and completely revolutionize your health. Reduce stress, improve brain function and power up your immune system in under five minutes a day. I've always believed that your health, whether it is good or bad, lies in your daily habits. Have you made it a habit to eat 8 servings of vegetables per day? Do you take your vitamins daily? Or do you make it a habit to eat fast food regularly? 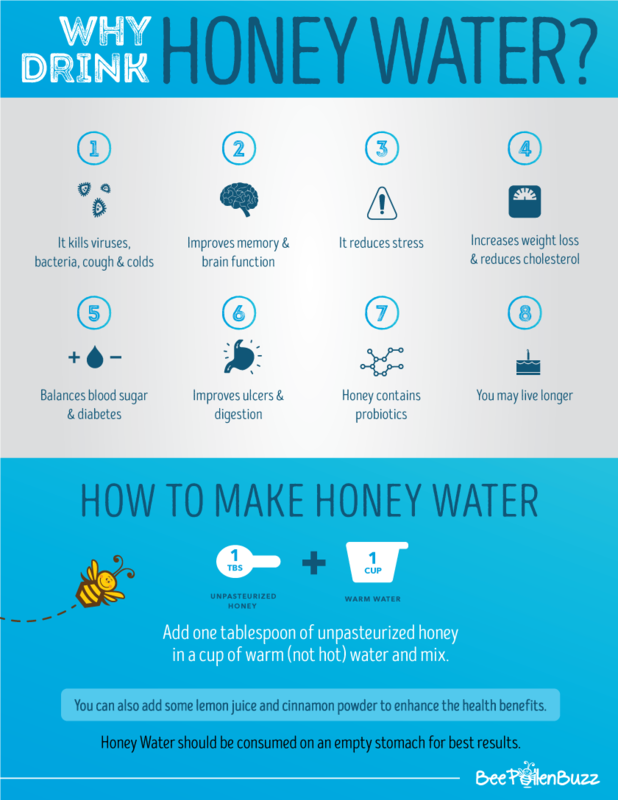 Or how about this; do you drink honey water daily? Honey water? You might be wondering how and when drinking honey water became a mandatory health habit, but for me it started about one year ago. 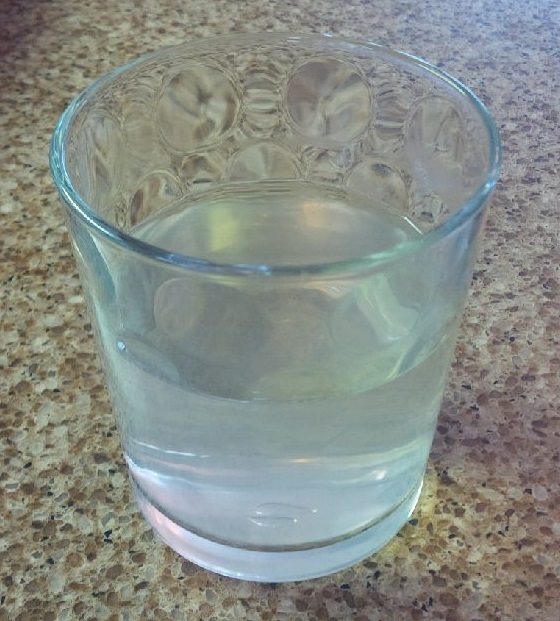 I began each day with a glass of unpasteurized honey dissolved in filtered water. 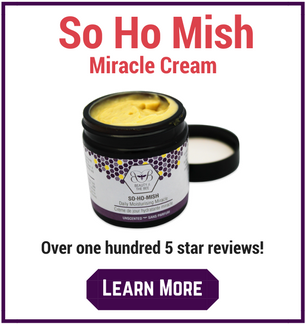 To say the results surprised me would be a dramatic understatement and this habit is now part of my mandatory steps to make your health BeeProof. Not only was I healthier than ever, but my body simply performed at a higher level. Do this for one year and you just might change your health in ways you'd never have imagined. I know I did. Here's why. Drink honey water daily and there is a good chance you won't get sick. It killed all floating bacteria in liquid, and 63 - 91% of biofilms - microorganisms that sometimes form a protective layer in sinus cavities, urinary tracts, catheters and heart valves, protecting bacteria from normal drug treatments and often leading to chronic infections. The most effective antibiotic, rifampin, killed just 18% of the biofilm samples in the tests. In another study of 300 children with upper respiratory infections and coughs, it was found that a 10 gram serving of honey before bed significantly improved symptoms according to parents. I found that drinking Honey Water first thing and then having a cup of my Raw Honey and Curcumin Wonder Drink about midday kept my brain functioning at optimal levels. In one study involving postmenopausal women, those who received honey showed improvements in their immediate memory. In another study, the normal diet of rats was supplemented with honey, and their brain function was assessed over a one-year period. The honey-fed rats showed significantly less anxiety and better spatial memory throughout all stages compared to the control group of rats. More importantly, the spatial memory of the honey-fed rats was significantly greater during the later months of the study, suggesting that honey was causing positive changes within the brain through neurogenesis (regeneration of brain cells). We all know chronic stress ages us and depresses our immune systems. We also aren't as happy when stressed. Finding foods that can lower the stress response in the body is important if health and longevity is one of your goals. Scientists in Malaysia set out to determine if honey supplementation aids in the quest to reduce levels of the stress hormone cortisol. During this time, they stressed the rats out by exercising them hard enough to elevate cortisol levels. Over-exercising is one way to raise cortisol levels. They then gave some of the rats the equivalent of 1 gram of honey per kilogram of bodyweight for eight weeks. The other rats got nothing. What the researchers found was that the rats that received the honey supplementation had significantly lower levels of cortisol than those rats that exercised but did not receive the honey. A study investigated the effect of raw honey on total cholesterol, LDL cholesterol, HDL cholesterol (your 'good' cholesterol), C-reactive protein (inflammatory marker), fasting blood glucose, and body fat. There were 55 overweight or obese patients in the study. They were fed either 70 grams of sugar or 70 grams of raw honey for 30 days. Shockingly, the honey group experienced reductions in all of the measured categories. Raw honey caused a mild reduction in body weight (1.3%) and body fat (1.1%). It also reduced total cholesterol by 3%, LDL by almost 6% and Fasting Blood Glucose by 4%, which is very positive if you have blood sugar issues. It gets even better. Inflammation was reduced by 3% while good cholesterol increased by 3.3%. If you eat a lot of carbohydrates, over time you will develop elevated blood sugar levels. Studies are now indicating that high blood sugar levels age us rapidly and lead to obesity, metabolic syndrome and diabetes. Unstable blood sugar also leads to blood sugar crashes, low energy levels and brain fog. Recently available data suggests that the "good bacteria" in our guts has something to do with how these conditions manifest. Recent findings are indeed linking gut flora as a potential contributor of obesity, insulin resistance, and diabetes. 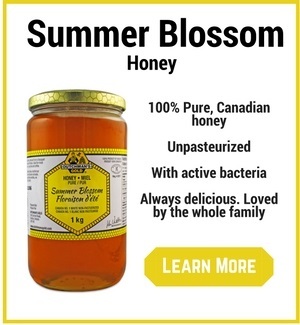 Fortunately, unpasteurized honey contains the 'good bacteria' needed to support these gut flora. These findings also underline data that demonstrate the beneficial effects of oligosaccharides (special sugars found in honey) on various abnormalities commonly associated with these conditions. Your health, whether good or bad, starts in your gut. Honey has strongly linked to accelerated healing of wounds. Could honey help heal the gut? I know during the year of drinking honey water, I found my need to use digestive enzymes vanished. Scientists recently carried out a study to evaluate the effect of honey on the lining of the stomach in animals. Twenty male adult rats were used in the experiment. The control group was fed a normal rat diet and water while the test group was fed honey water (1 ml of honey for every initial 10 ml of water for each rat daily) for twenty-two weeks. After twenty-two weeks the rats were analyzed. Amazingly, the analysis showed that honey significantly reduced ulcer scores in the test group compared with increased ulcer scores in animals fed rat food. Honey had begun healing the ulcers in the rats guts. You've likely heard of probiotics, right? They are one of the natural health industry's most popular and best selling products. With all of the gut issues that people are experiencing today due to the overly processed diets most of us eat, we're having to swallow probiotics by the handful to try and maintain our health. But perhaps we don't have to anymore? A recent study identified 32 different probiotic strains found in commercially available honey (acidophilus is the most common probiotic sold today). It turns out the secret to exceptional gut health just might lie in a teaspoon of raw honey each day. Drinking honey water daily just might help you live longer according to a study in Current Aging Science. This was a small study so the results always have to be taken in context, but the study suggested that those who regularly consume honey live longer than those who don't. This doesn't surprise me. When you take into consideration the many other studies done on raw honey showing prevention or treatment of individual diseases such as cancer, diabetes and heart disease, the fact that the study showed a significant drop in all-cause mortality (the risk of dying from anything) during the 25 year follow up should not shock anyone. Making honey water is extremely simple and takes only seconds to make. Plus, it tastes delicious. Add one tablespoon of unpasteurized honey in a cup of warm (not hot) water and mix. You can also add some lemon juice and cinnamon powder to enhance the health benefits. Honey Water should be consumed on an empty stomach for best results. 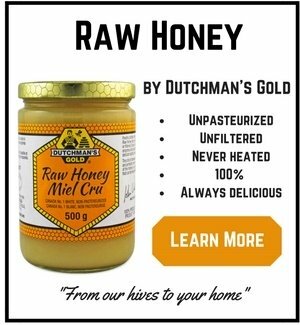 In the picture below I used Dutchman's Gold Raw Honey.